Cupcake is a snooty, cub villager from the Animal Crossing series. Her name relates to her sugar pink colour as does her catchphrase, "sugar pie". Cupcake is a pink cub with cream paws and with a cream muzzle. She wears purple eyeshadow and her eyelashes are thick and curled. Cupcake has a small patch of brown hair on her head. She can be found wearing a Dreamy Shirt, her attempt at looking Gracie couture. In Doubutsu no Mori, her hair was a blueish purple and her makeup was dark pink. As a snooty villager, Cupcake will appear uptown, classy, and chic. With this, however, she will appear rude, belittling, and snobbish when talking to the player or other villagers in the town, usually criticizing their dress sense or fashion. She will talk about love. When talking to the player enough times, she will befriend them but still remain subtly rude. As with all snooty villagers, she has an interest in clothes over other hobbies. 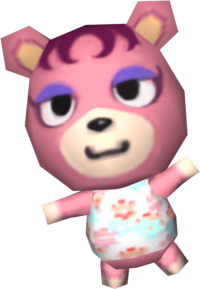 She will have problems socializing with other villagers, usually lazy villagers by disagreeing with their choice of lifestyle or getting offended by a jock villager, who has questioned her physical fitness. Cupcake has an old-fashioned feel towards her house. She has K.K. Waltz playing on her Phonograph. Not to be outdone by the brightly-colored animals in town, Cupcake uses a complex mix of shampoos, toners, conditioners, and revitalizing moisturizers to keep her fur as pink and shiny as it can possibly be. The e-Reader card for Mr. K.K., which features Cupcake. Spanish Rosita Meaning "little rose" or derived from the names "Rosa" and "Rose," meaning "fame"
Modified on March 4, 2019, at 17:51.